Traversing Birmingham city centre on foot is, currently, no simple feat. 2015 sees the demolition of John Madin’s Central Library and the redevelopment of Paradise Place, a complete renovation of Birmingham New Street station, the installation of tram tracks joining New Street and Snow Hill, various points of heating and electrical maintenance throughout the city centre, as well as other demolitions and roadworks. These interventions may be considered by some to be an unsightly inconvenience, but personally, I find the current landscape of the city centre to be fascinating, and the perfect place to explore. There is no doubting the fact that us Brummies are passionately nostalgic, and the popularity of Brumpic is testament to that. Even for the aficionados among us (myself included) who are too young to properly remember, for instance, the old Bull Ring Shopping Centre, or other long-gone city centre features, there comes a sentimental wistfulness from looking at photographs of the way things used to be. The recently revealed Phyllis Nicklin images were received with immense interest, and the images of D.J Norton, John Ball, and Geoff Dowling are always equally popular with followers. So what is it about these post-war images in particular which are so fascinating to us? Perhaps it is the sheer amount that has changed in our city’s streets within living memory. Or perhaps, could it be that some of these images, which captured the construction of a modern Birmingham, resonate most with us because we can relate to them? In 40 or 50 years, future generations of Brumpic followers (which I do not doubt there will be given our appetite for photographic history) will look back at images of the city centre in 2015 and what they will see is a landscape changing, once again, in parts almost beyond recognition. They will see roads almost totally blocked off by temporary fencing, a tangled mass of scaffolding adorning what seems like every other building, and gaping post-apocalyptic holes in the streets themselves. These images will not be, in some ways, dissimilar to those post-war images we reflect upon today. I would even guess that in the time around 2050-60, the citizens of Birmingham will find themselves once again within a maze of re-routing, demolitions, and construction. In a city which is in perpetual flux, change is the only constant. I was somewhat hesitant to include the word ‘psychogeographer’ in the title of this piece, as it can be somewhat off-putting at times, especially for those who may not have come across it before. Psychogeography is a term coined in the 1950s by a Frenchman, Guy Débord, who defined it at the time as being ‘the study of the precise laws and specific effects of the geographical environment, consciously organised or not, on the emotions and behaviour of individuals’ – a stuffy definition, which in all honesty, means little more to me than it does to you. Many have tried to define psychogeography with more clarity over the years but it is something which is difficult to pin down and resists definition, perhaps as it is constantly shifting and shaped by those who practice it. It is something often associated with urban walking, a drift (or dérive as it is known within psychogeography) through the streets which allows, often through some form of documentation or recording, a deeper insight and heightened awareness of the way we are affected by our environment. My own personal understanding of psychogeography is that it is something many of us naturally ‘just do’ perhaps without even realising, and is now actually more current than ever in the smartphone age, where a portable means to photographically documenting and sharing our own dérives is readily available. I am a selfconfessed iPhone addict and social media enthusiast, and the urge I feel to capture the city as I pass through it is strong. I am also an advocate of, rather than cynical towards, the use of photo editing apps: I truly believe we should fully embrace an make the most of the technology available to us. All of the images I have included are my own, captured and edited on iPhone. I would urge you to see their less-than-perfect quality as part of their charm, and important to the images in that it makes them very ‘of the time’, the same way we would consider the grain and discolouration of the post-war images we are so fond of. I would also urge you, reader, to make the most of your own opportunities to capture with your smartphone or camera the changing city as you weave your way through it – not only for your own benefit, but for that of future generations. One area of extensive redevelopment is John Madin’s doomed Central Library and the surrounding Paradise Circus. Most areas around the Library building are now blocked off from pedestrian access, the fencing and boarding increasing the suspense for a demolition which despite having been scheduled to begin this year, seems almost inconceivable. This denial of access to a space has the effect, for me at least, of increasing the longing to explore it. The roads surrounding Paradise Circus are a nightmare for drivers, but for pedestrians, circulating the area is a very interesting experience. Behind what seems like miles of fencing and barriers, stacks of bricks, slabs and other materials make for intriguing interventions, in the process of being taken over by rampant weeds: a mini concrete jungle of sorts. 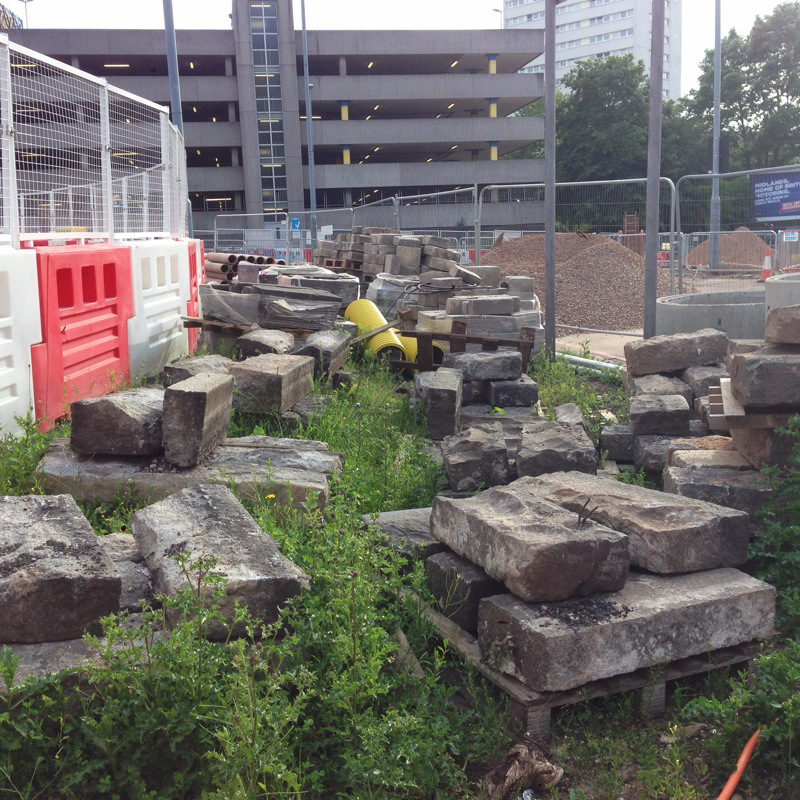 Some might consider these construction ‘dumping grounds’ to be an unsightly mess, but I would suggest that much more can be gained from the experience if we view them in the same way that we might consider, for instance, a piece of public sculpture. Also in the Paradise Circus area, we find a plethora of signage; a visually confusing array of words and symbols which is present throughout the rest of the city centre, especially around New Street itself and the current redevelopments taking place there. Sometimes the placement of these signs can be somewhat curious – here on John Bright street cyclists are apparently diverted through the legs of this 1986 sculpture. Obviously these signs are important for vehicles, construction workers and pedestrians alike, but when there are so many, they can, as I said before, be very visually confusing, and interesting to consider what the psychological effect of seeing these signs and symbols might be, even if in a subliminal sense. It is not just road signs which pictorially adorn the streets around New Street station. 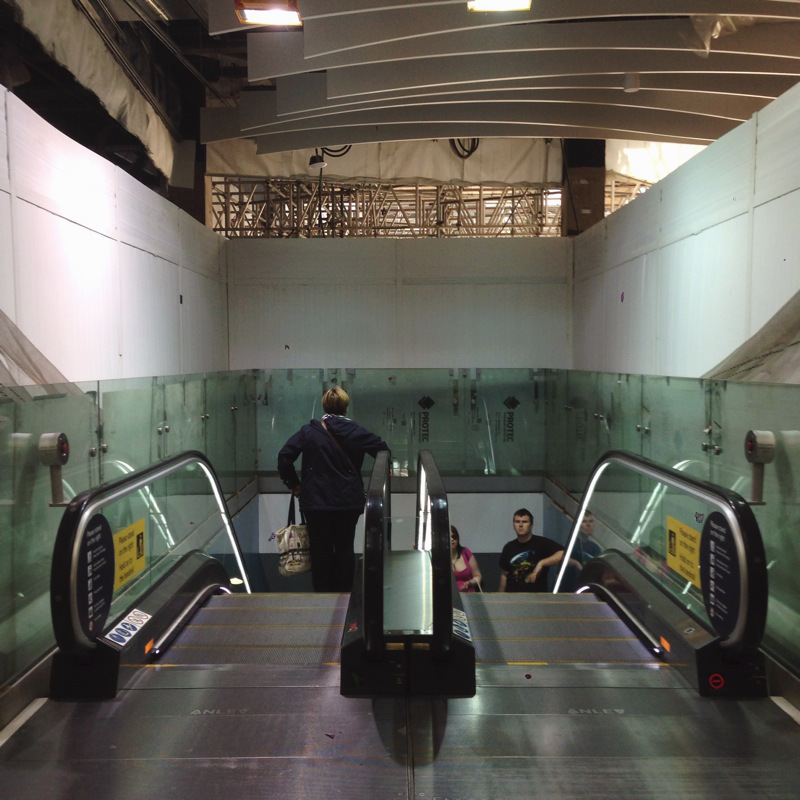 A graphic marketing aspect of the redevelopment is the motif of a caterpillar morphing into a butterfly, their bodies formed by architectural features of the station and surrounding buildings, an image which can be seen upon many boards concealing the construction. It might seem on some levels a slightly clichéd metaphor, but once you consider the physical layers of concealment and protection around the station as a chrysalis or cocoon of sorts, and the station itself as a living and breathing organism, it becomes somewhat intriguing. 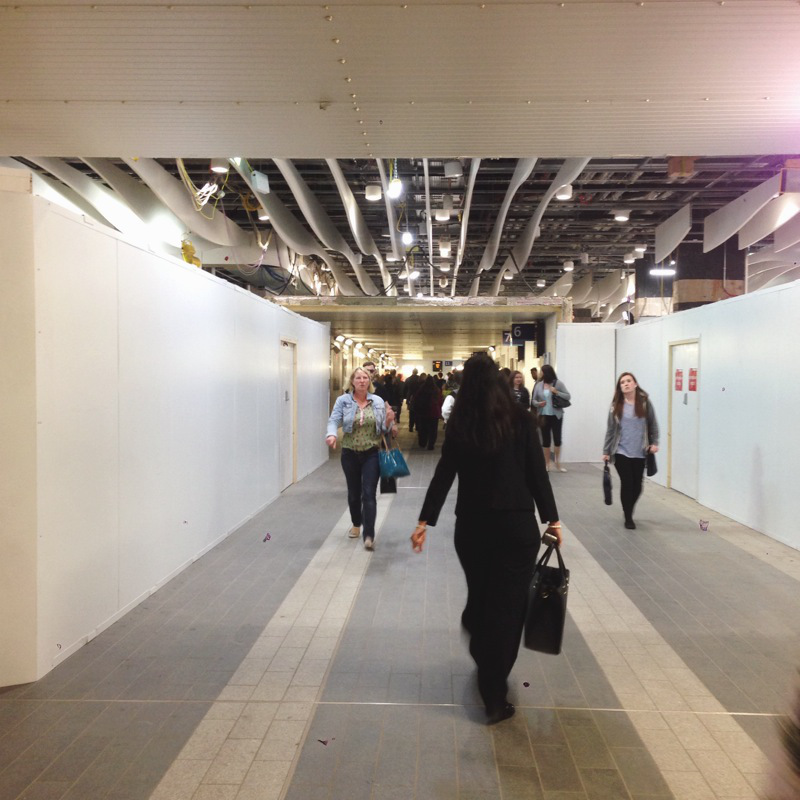 Inside the station, passers-through are re-routed through corridors of temporary boarding, which conceal and protect the construction work taking place. Above the ‘A’ end of the platforms, some of the upper boarding has now been removed, revealing glimpses of the bright and lofty atrium which will be at the centre of the development. The realisation that all this has been taking place is somewhat strange for a daily station user, as you become temporarily accustomed to the changing environment, and cannot imagine the metamorphosis occurring beyond the walls in which you are enclosed. Descending, we find the partially completed platforms bathed in a soft greenish light, the protective gauze overhead glowing with an ethereal quality. The outside of the station in its current state is even more interesting, I would say, than its interior. Temporary scaffolding stands alongside the angular freeform metal framework, onto which panels of reflective cladding are added, piece by piece. The resulting effect is that of an amorphous silver blob, which to someone who hadn’t witnessed the build, would appear almost structurally impossible. This trompe-l’œil is a typical feature of postmodern architecture, and observing the construction of this illusion is an interesting experience. 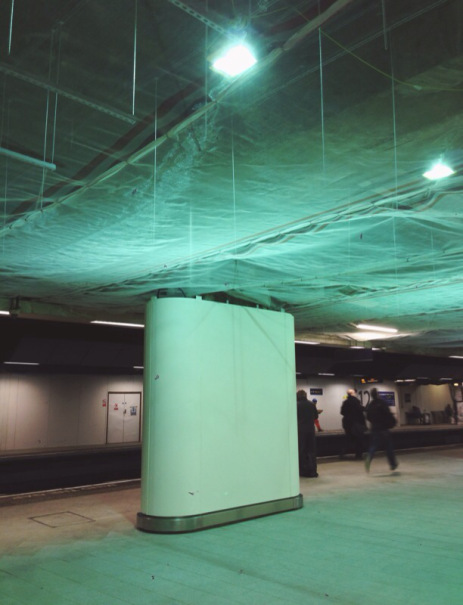 Other temporary embellishments we see in and around the New Street station redevelopment are these temporary lights. Some of them hang at irregular angles, while others are attached to outdoor scaffolding structures, creating interesting sculptural forms, which are especially captivating at night. 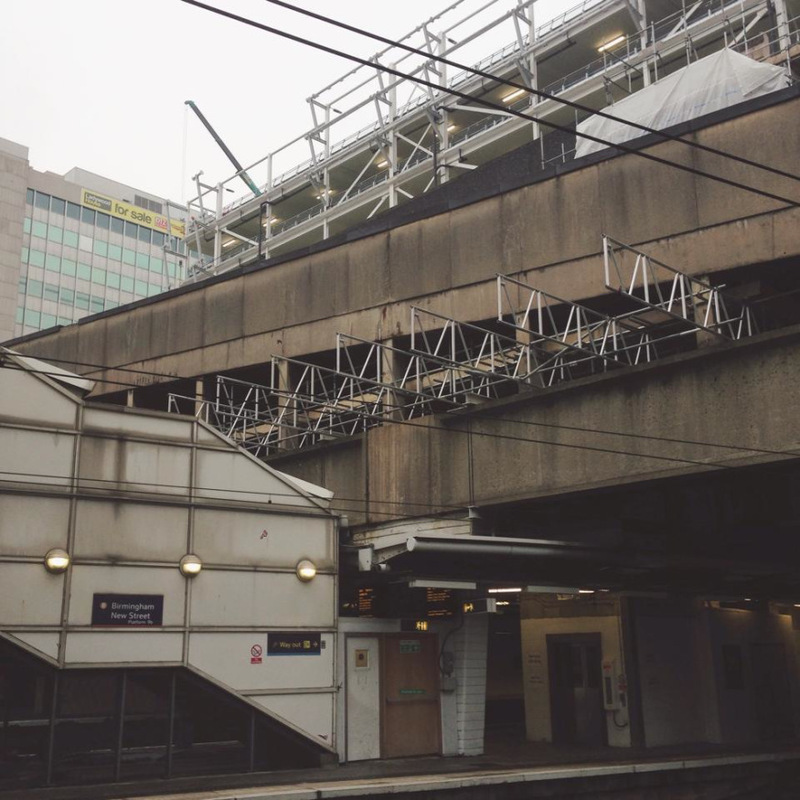 Although admittedly, part of me wishes the station could stay in its current state of semi-completion, with its bare alien exoskeleton and temporary archi – sculptural interventions, I am eager to see the project finished, and to explore the development in a state of completion. 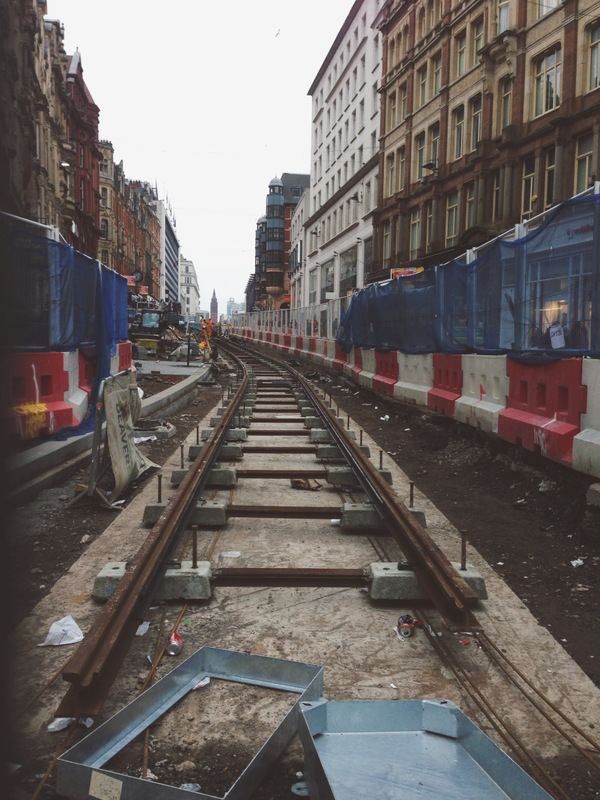 I also recognise the inconvenience and pedestrian congestion caused by the street works taking place around the city centre, but I would suggest that we should make the most of our opportunities to explore the urban landscape as it currently is: to document, record, and share it – for ourselves, and for future generations of proud, nostalgic Brummies.